12-25 August 2001 in Andalucia, Spain, mainly in Conil but also at El Palmar and Barbate (both nearby) and Tarifa, the southernmost part of Spain. All these locations are on the Atlantic coast. 1-7 June 2002 to same area with addition of Sanlúcar. Most (60%) showed brown speckles over the forehead and the rest of the head (not neck); the remainder were often fairly white still. Legs: pale yellow, slight orange tint, feet yellow. Gonys spot: orange-red, not very strong. Bill: rather washed out yellow. Legs -- long, every one, equal to height of body. Calls -- mew like deep graellsii, long deeper than graellsii and hoarser (more guttural). 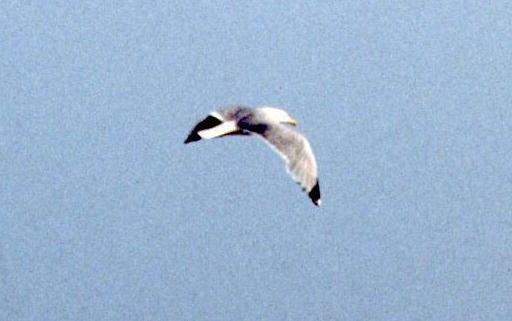 Juvenile of michahellis in flight. Moderate contrast on the underwing coverts. Quite dusky on sides of breast but head is quite pale. White upper tail and relatively narrow subterminal dark tail band, indistinct pale primary panel, only moderate contrast in underwing coverts. A fly-past individual, but most can be separated from atlantis quite readily on bulk and structure. In this case the heavy chest, head and bill are obvious. 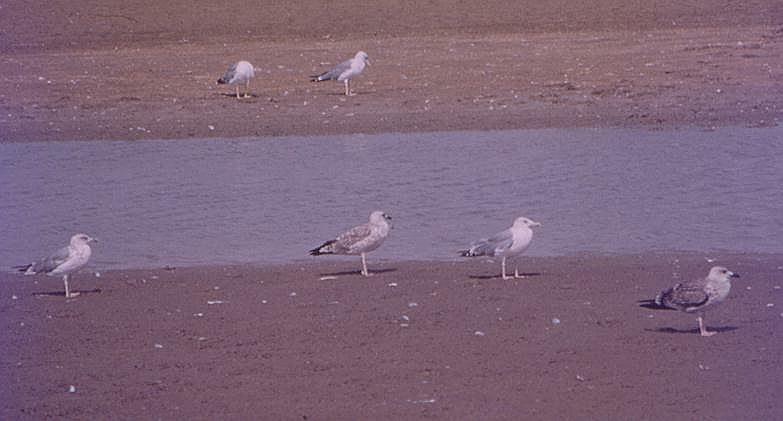 Three adults of michahellis, four Audouin's Gull adults, one LBBG adult, probably intermedius. Two michahellis adults are in flight. On left, almost complete white tip on P10, large mirror on P9, moult P6-P7, P5 descending, P1-P4 new. On right, slightly more advanced P1-P5 new, P6 almost grown, P7 missing, P8-P10 old. 12 Audouin's Gull adults, one Mediterranean Gull L. melanocephalus second-summer (lower of left group), two michahellis adults (second lowest in centre, upper right). One adult michahellis is moulting P7/P8. Compared to Audouin's Gull the michahellis are darker, have pale yellow bills and have a heavier body particularly on the chest and neck. Two Audouin's Gull adults in flight. Note elegant almost Kittiwake Rissa tridactyla look. Their calls are rather like gruff Kittiwakes. 21 Audouin's Gulls (20 adults, one juvenile on extreme right). One michahellis first-summer (circling at top) still growing secondaries and apparently with P9 and P10 missing. 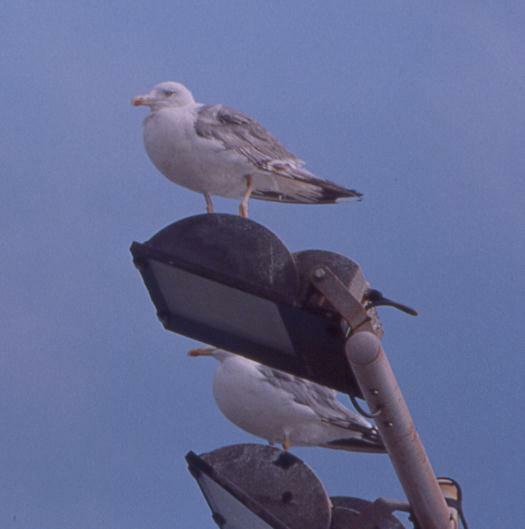 Two adults perched on a lamp post. Compared to local Yellow-legged Gulls in the harbour, these were a paler, more leaden grey lacking blue-grey tones; they had heavier bodies, longer legs and deep guttural long calls. 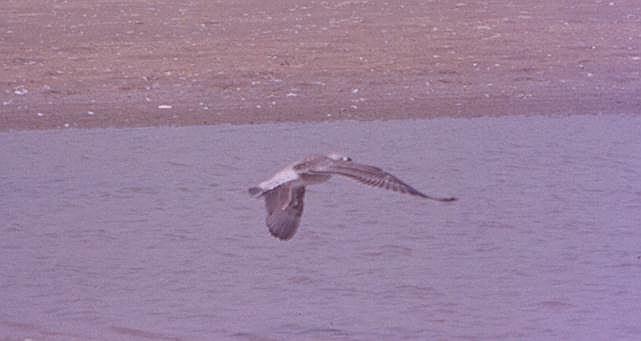 The photographs below include a small, compact dark Atlantic Yellow-legged Gull, discussed elsewhere . The long legs, bold structure and boxy heads are obvious on the five adult michahellis. 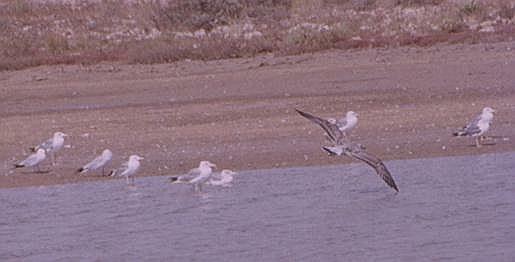 Two Audouin's Gull adults (extreme left and third from left), six adult michahellis and one juvenile michahellis showing pale upper tail, fairly narrow subterminal tail band, two bars on the inner wing and a barely visible pale primary panel. 11 michahellis (ten adults, one immature). Typical slouching posture of one at rest in the foreground. 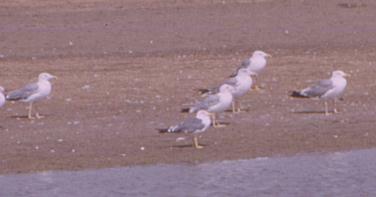 More photographs, taken on 4th June 2002, comparing michahellis with Yellow-legged Gulls showing characteristics of those from the Atlantic-Mediterranean intersection zone are shown elsewhere . A fairly typical michahellis in general with solid black triangular wingtip, large mirror on P10, small mirror on P9, broad bar on P5 and a large spot on P4. Note the long wings and bulky head and chest. Started moult -- missing P1. Quite a number of the michahellis in south west Spain do not show a mirror on P9 (like this one). Large mirror on P10, solid black triangle on outer primaries and broad band on P5. No mark on P4. Moult has yet to start on primaries. A large mirror on P9, a white tip to P10, broad band on P5 and solid black triangle on outer primaries. This one is growing P2 and missing P3. 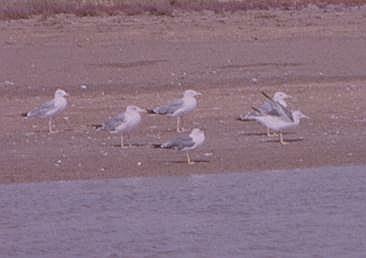 The Yellow-legged Gulls found at the marshes, lagoons and marismas of south-west Spain are virtually indistinguishable in size, structure and calls from michahellis in south-west France and in the main part of the Mediterranean. The wingtip pattern of adults shows 65% with a white tip to P10 (perhaps inflated by wear), 40% with a mirror on P9, 100% with a solid black triangular area from P6-P10, 77% with a broad band on P5 and 50% a spot on P4. Differences from the Dark form are that relatively more show a mirror on P9, a broad bar on P5 and a spot on P4. A difference from michahellis in the Camargue is that fewer show a mirror on P9. In June adult primary moult ranged from none to P2/P3 with -/P1 the most frequent. In mid-August it ranged from P5/P6 to P7/P8 with the latter the most frequent state (46%). One juvenile was seen as early as 5 June at Sanlúcar. By August the juveniles of this form do not show heavy markings on breast and belly, show quite white heads (except for the eye spot) and are less grey-brown than the Dark Atlantic form with 63% having a ruddy tinge. The bills appear to be always all black. 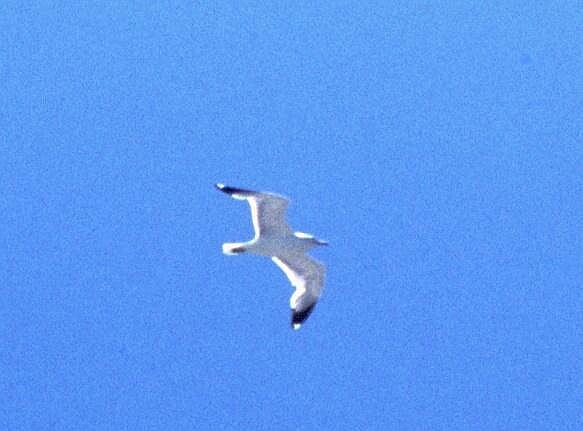 The upper tail appears to be always a bright white. The pale primary panel is usually indistinct (67% of cases). The tertials show bold white tips rather than the narrow pale fringe usually shown by the Dark form. Sample sizes for juveniles are small. In June most (73%) first-summers show sparsely marked breasts and bellies, most (85%) show basically white heads but with some residual duskiness particularly around the eye, all show bright tails and as many as 60% show a pale base to the bill. Although pale they are not as white as some michahellis appear to be, perhaps reflecting an Atlantic influence. All had a ruddy tinge to the mantle. On 12 birds half had moulted P4/P5 and half P5/P6. In August first-summers/second-winters are often rather washed-out with straw-coloured legs. In June second-summers show adult grey on the fresh inner primaries. Moult on 14 birds showed 5 each with P5/P6 and P3/P4, three with P4/P5 and one with P2/P3. Hence the moult is only slightly behind that of first-summers unlike adults which are well behind. The bills are usually yellow to 3/4 of the length from the base and the legs are a bright yellow. In August second-years show yellow bills with a dark band, creamy legs (less yellow than on most adults) and retain some sparse mottling on the side of the breast. Populations in the marshes, lagoons, salinas and marismas are bimodal with the vast majority being large and bulky and a small minority being much slighter. 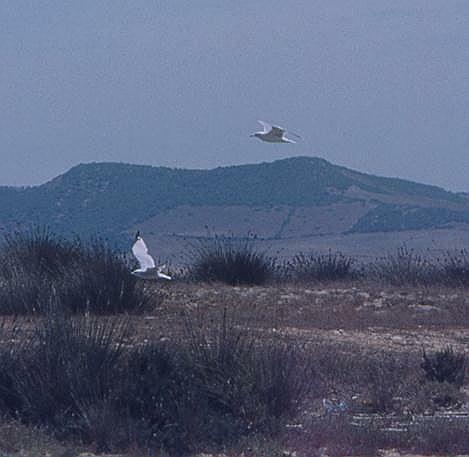 In Cádiz and Huelva the Yellow-legged Gulls breeding in these areas were thought to originate from the Mediterranean (Ruiz & Solis, 1984) but no detailed field descriptions were available. 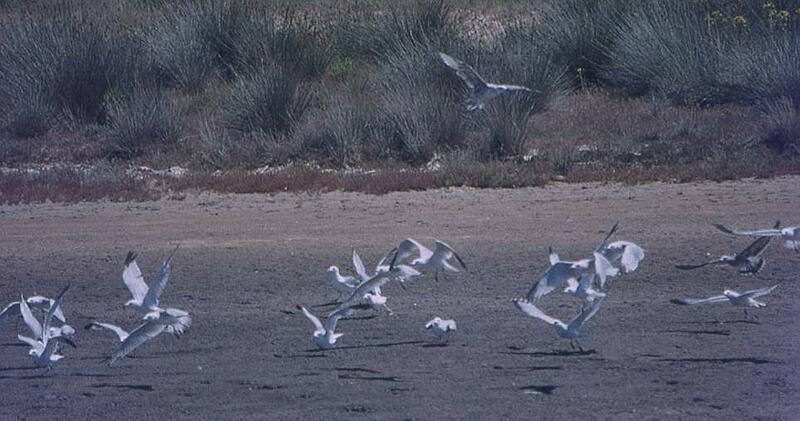 Breeding started here in a completely new biotope for Yellow-legged Gulls in Spain c1980. Conil 12th Aug 2001: 44 Audouin's Gull (including 3 three juveniles); 10 LBBG mostly graellsii; 320 Yellow Legged-Gulls (nearly all michahellis). Barbate 15th August 2001: c600 michahellis, three atlantis. 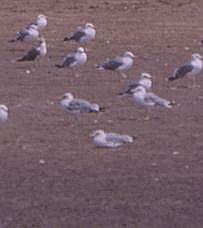 Conil 16th August 2001: 51 Audouin's Gull (3 juveniles); 2 LBBG adults, 14 atlantis, c100 michahellis . 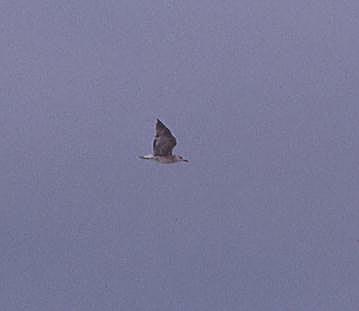 Conil 4th June 2002: 33 michahellis (14 second-summer, 11 first-summer, 8 adult/third-summer), 5 Atlantic-Mediterranean intersection types (4 second-summer, 1 first-summer), 1 Audouin's Gull (first-summer), 1 LBBG intermedius adult. None apparently breeding. Sanlúcar 5th June 2002: 18 michahellis (8 adult, nine first-summer, one very recently fledged juvenile), 1 atlantis (first-summer). Apparently breeding in salinas upstream of Sanlúcar. Barbate Marshes 7th June 2002: 40 michahellis (6 adult, 9 second-/third-summer, 25 first-summer). Apparently breeding in marismas. Caňos de Meca 1st-4th June 2002: 6 michahellis (occasional single adults N). Barbate Cliffs 6th June 2002: 3 michahellis (3 adults N from 10:30-16:00). None breeding. Belonia 7th June 2002: 6 michahellis (5 to NW 16:35-17:15, one second-summer on sea). 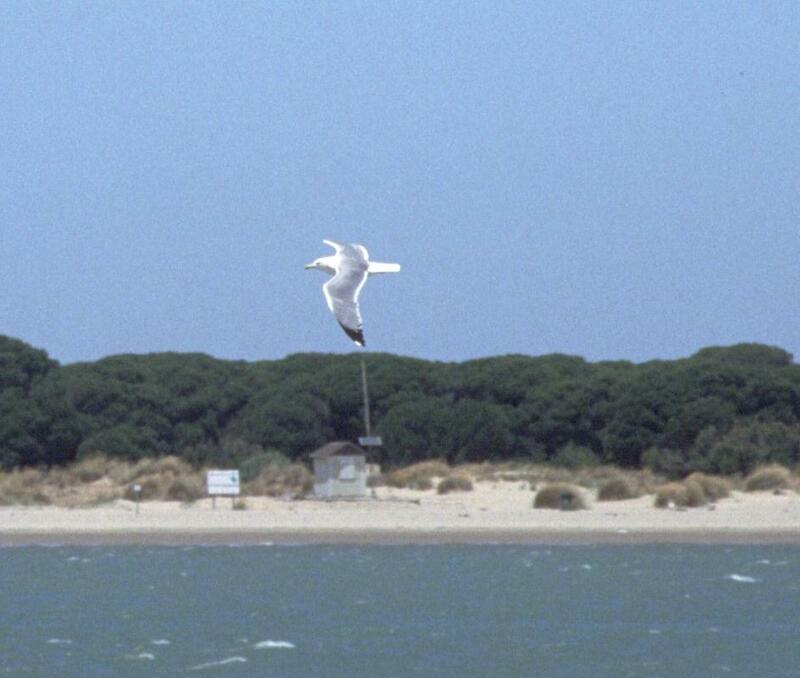 (La Gaviota Argéntea criando en salinas de la provincia de Cádiz). Translation: during the spring of 1984 a colony has been discovered, formed of 48 pairs, in the salinas del Puerto de Santa Maria (Cádiz). In agreement with the owner of the salinas the species carried on breeding for 5 years in small numbers in this place. Another 2 pairs have been found breeding on the lagoons of Zorrilla, also in the province of Cádiz. In our view this is the first time that a settlement of the Herring Gull, is based in a biotope not restricted to the sea in the Iberian Peninsula, maybe reflecting a general expansion. Comment: indicates breeding started c1980. © Copyright Nick Rossiter 2002.